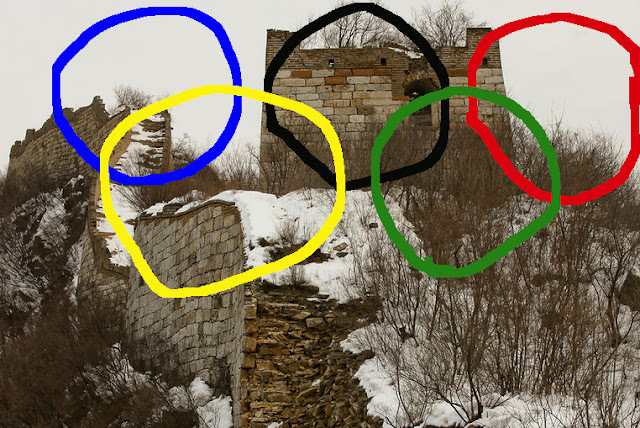 I can't say I have felt much enthusiasm over Beijing's bid for the 2022 Winter Olympics. In fact, I had hoped another location would be chosen. I will refrain from detailing the reasons, because I might have had a change of heart after seeing a potential logo for the games if they take place in Beijing. The image conveys with great clarity the feelings of its creator and evoked such strong emotions from myself that tears nearly poured out of my eyes. I look forward with great anticipation to seeing Tao's design for the mascot. 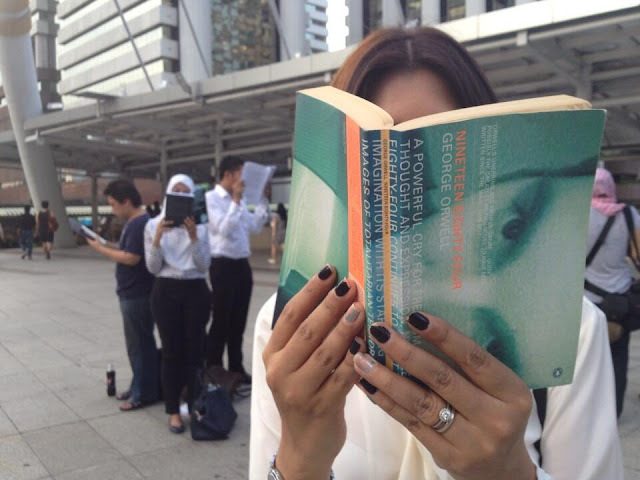 The silent reading protest against the military coup in Thailand occurred in a country which has seen a sharp recent increase in censorship. 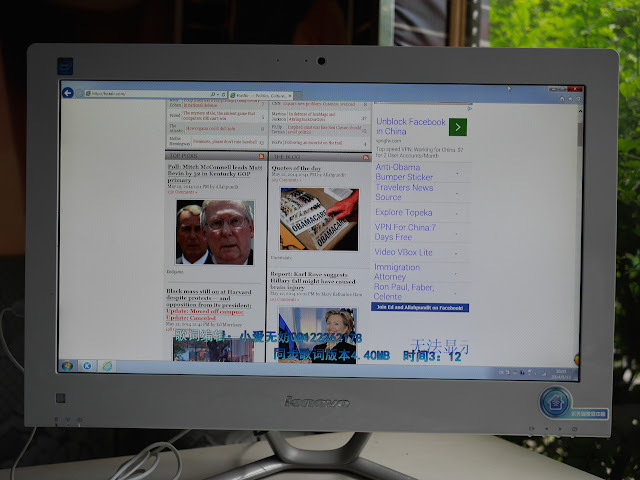 For one overview of the censorship now occurring in Thailand's traditional media and online social media see Aim Sinpeng's guest post on The Washington Post. A number of Thai companies have readily accommodated the military's requests, but foreign companies with online services popular in Thailand are proving to be more of a challenge. For example, Facebook and Google so far haven't displayed any eagerness to meet with Thai officials and "discuss online anticoup dissent". The director of the Ministry of Information and Communications Technology’s IT crime prevention bureau, Thanit Prapatanan, tells VOA it will likely be several months before the plan for the new control system is worked out. 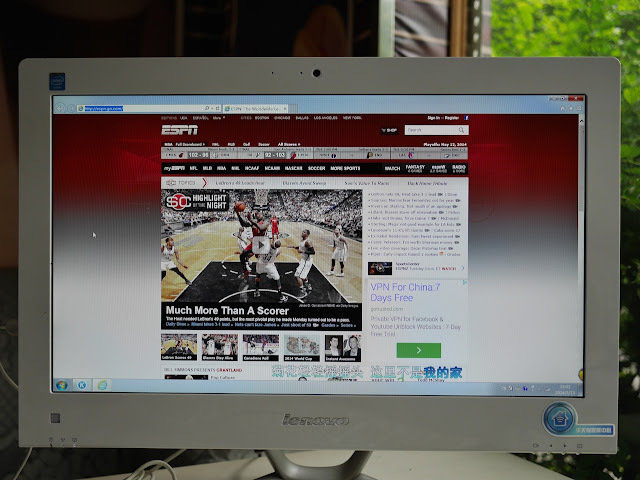 Thanit cites the example of China, where he argues that filtering does not have a significant impact on society, rather it just blocks some websites deemed dangerous, but all Internet ports are not closed. Thanit's use of China as a positive example says much. I won't try to guess what steps Thai's military will take next. 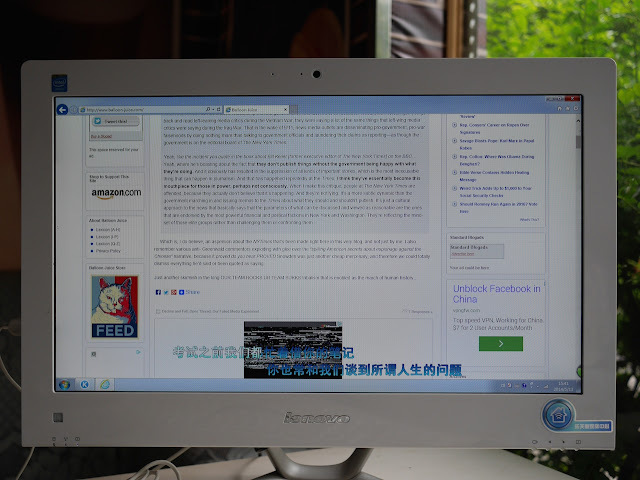 But if Thailand follows China's lead in restricting online expression, it's hard to imagine that the censorship won't significantly impact Thailand's society in Twenty Fourteen. After two posts about American ads, I will bring things back to China while sticking with the ad theme. One of the first sights after entering through the northeast gate of the locally popular Yueping Park (岳屏公园) in Hengyang, China, is a helpful map. Below the map is something perhaps less expected. 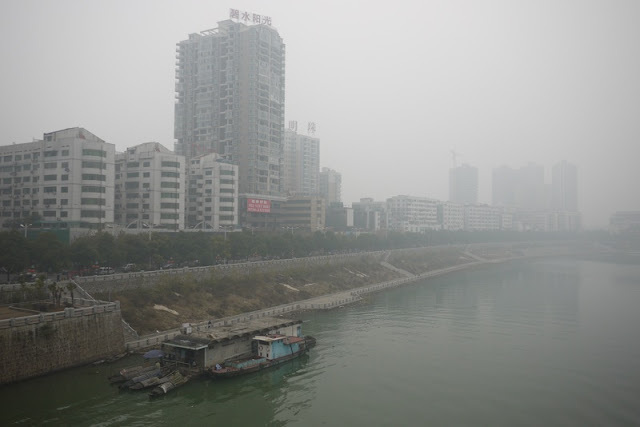 It is not an ad for the nearby Hengyang Zoo. Instead, it is an ad for a photography studio which might have a penchant for cats. Fate or blind luck later brought me to the studio's location. The two signs on the pedestrian street in front of it were hard to miss, if for no other reason than that they were directly in my path. I don't have any strong opinions about the ads like I did for the Apple or ESPN ads. 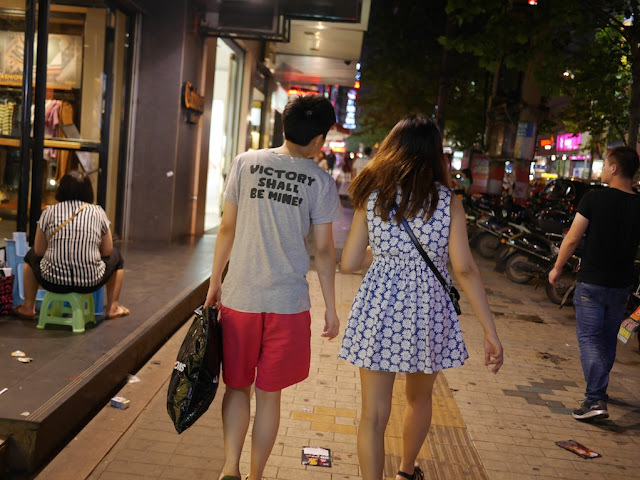 But I will note that the British flag design on the one woman's top fits a fashion trend I have noticed in China. More on that topic in a later post. Pink boxing gloves are a far less common sight. 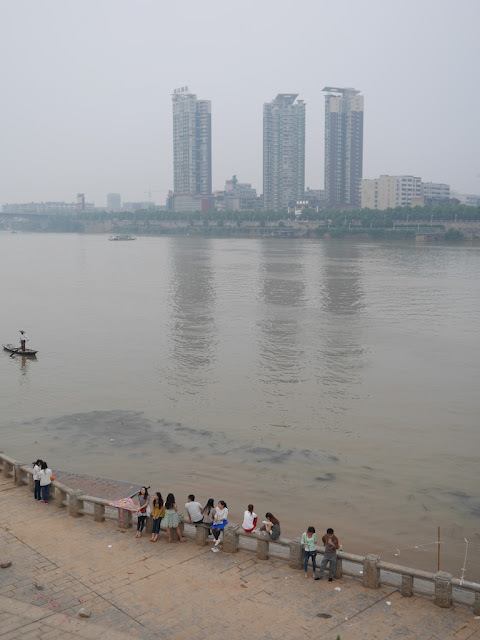 Flooding caused by recent heavy rains has led to at least 37 deaths in southern China. 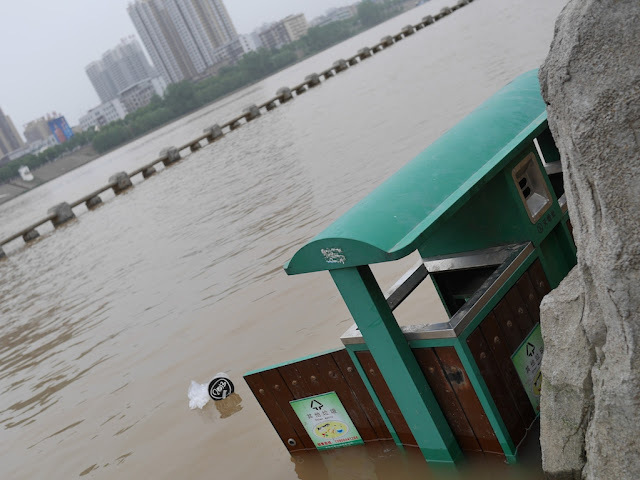 The Wall Street Journal posted a slide show showing some of the rain's impact in Hunan, Jiangxi, Guangdong, and Fujian provinces. 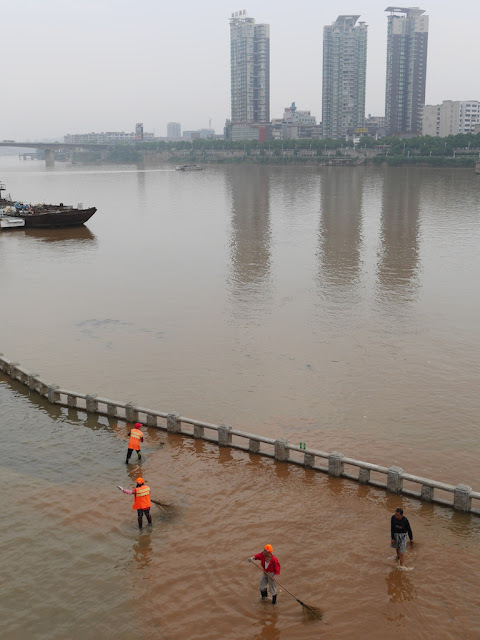 The rain has been heavy at times in Hengyang, Hunan province, but I haven't noticed anything calamitous in the central urban area where I have spent most of my time. 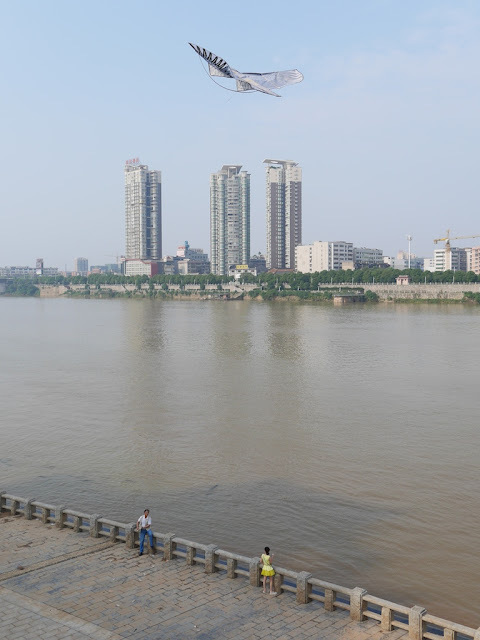 Flooding has been easy to see, though, along the Xiang River (also called the Xiangjiang River). The stone railing was completely submerged at one point. Signs of earlier flooding are evident. ... today cleanup operations were underway to remove silt and other debris. I briefly met part of the cleanup team, and many of them appeared to be proud of their work. One person even asked me to take a group photograph. The second woman from the right made the request. They probably don't get as much positive attention as they should. 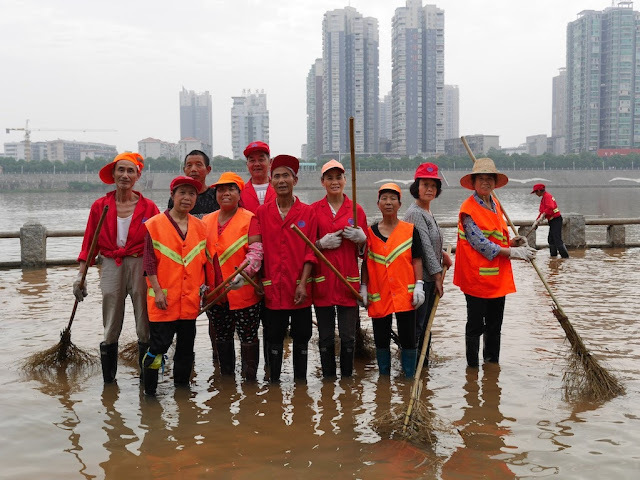 But their work will mean the flooding's effects here will soon be forgotten, and people will be able to once again enjoy not working next to the river. 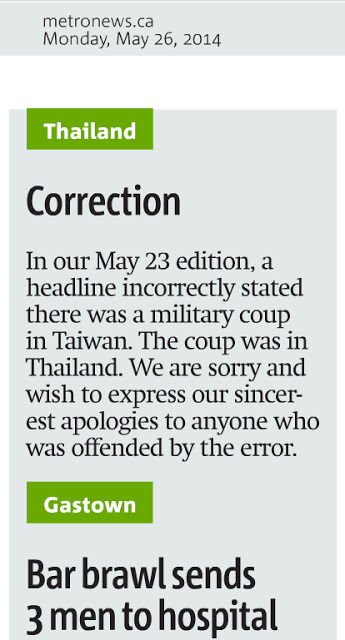 [Canadian Joel Charron, an English teacher in Taiwan,] added that the editor of Metro was probably not the only person in Canada who confuses Taiwan with Thailand. “When I first got here [Taiwan], some people back in Canada thought I was in Thailand. I got concerned e-mails after the tsunami in 2004, asking if I was safe,” he said. . . .
Tourism Bureau Deputy Director-General Wayne Liu (劉喜臨) said the incident has served to remind the bureau to work harder to promote Taiwan abroad so foreigners will not keep confusing it with Thailand. As Shan also notes, additional reaction included the Taipei Economic and Cultural Office (TECO) in Vancouver formally requesting a correction. So I believe that ties things up regarding Metro Vancouver's eye-catching headline. But as Taiwan's Tourism Bureau Deputy Director-General's comment indicated, challenges lie ahead if Taiwan desires to reduce the number of people confusing it with Thailand. Finally, even though I am already familiar with both Taiwan and Thailand, in the process of writing these posts I still learned a few things, including, based on the information below the correction, that Vancouver has a Gastown. Hopefully nobody confuses it with Gassville. 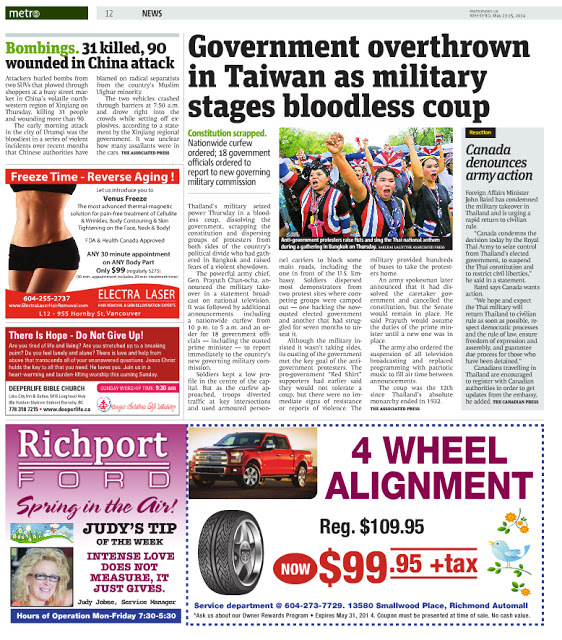 In response to my post about Metro Vancouver incorrectly claiming there was a coup in Taiwan, I have seen many people comment elsewhere that, like me, this wasn't their first time seeing or hearing someone confuse Taiwan with Thailand. So I will now present a brief beer quiz that may be useful for helping raise further awareness of the Taiwan / Thailand distinction. 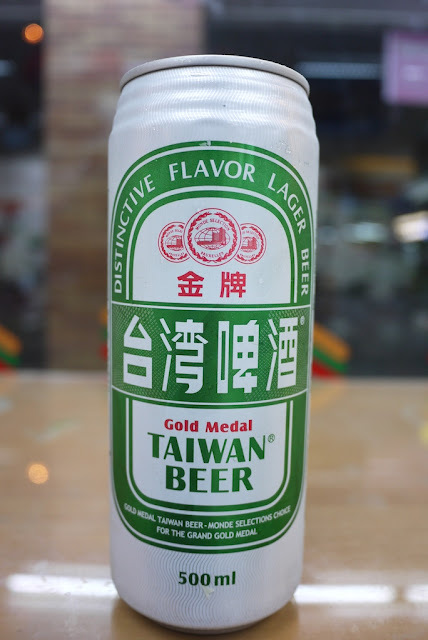 Question 1 (no time limit): Is Mystery Beer #1 a Taiwanese beer or a Thai beer? 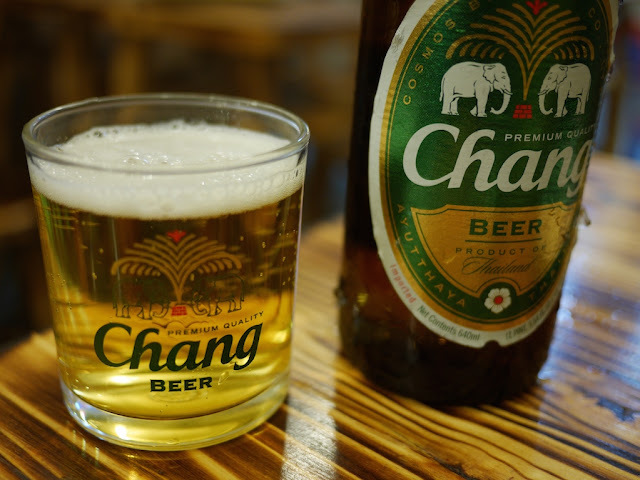 Question #2 (no time limit): Is Mystery Beer #2 a Taiwanese beer or a Thai beer? And this concludes today's (and possibly this year's) tests here. One time in the U.S. when I mentioned I had been to Taiwan, a person I was speaking to replied, "Oh, I LOVE Thai food!" After a brief brain freeze, I explained that Thai food is Thailand's cuisine and Taiwan's cuisine would be described as Taiwanese. The person was clearly embarrassed, although I explained I thought it was understandable and suspected many others could make a similar mistake. 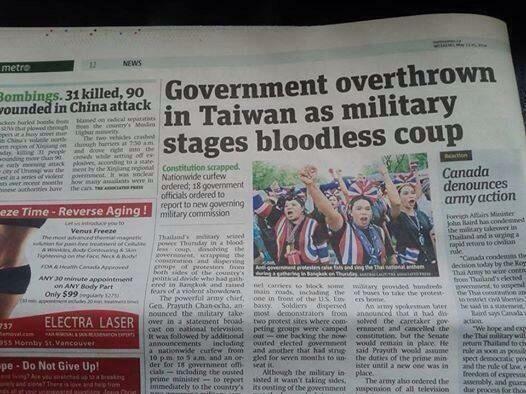 The article headline "Government overthrown in Taiwan as military stages bloodless coup" contains a not-so-minor mistake. As the AP article below correctly states, the coup was actually in Thailand. So, to be clear, Taiwan is not the home of pad thai or tom yam goong, and the Taiwanese military has kindly refrained from overthrowing its democratically elected government. I recommend the Vancouver Metro staff take a visit to Taiwan. 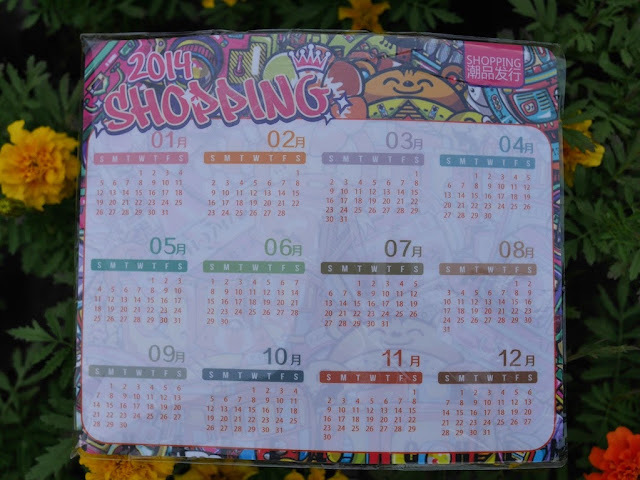 If I am there at the same time, I would be happy to treat them to some of Taiwan's many delicious local specialities. Afterwards, they should be less likely to ever confuse it with Thailand. UPDATE: See the new post with more reaction and a correction from Metro Vancouver. 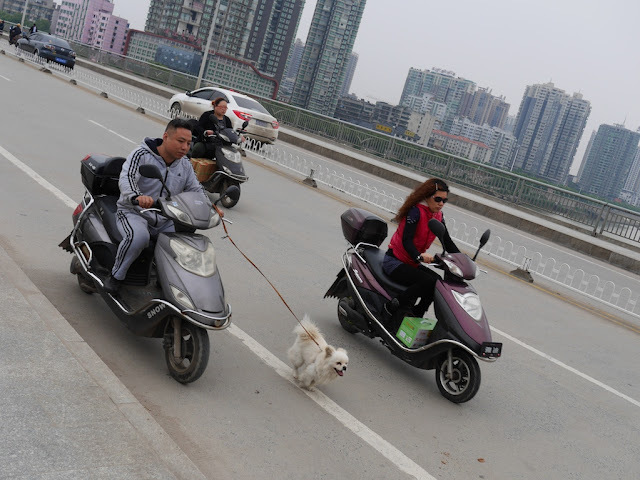 In contrast to a man I saw taking a dog for a run while he rode a motorbike, a woman I saw today with a non-motorized vehicle expended more energy than her dog as they moved about Hengyang. John Suter will drive his black standard poodles up the Iditarod Trail for the last time in 1991. The three-time Iditarod finisher has been trying for 14 years to raise an all-poodle team to run in the 1,200-mile sled dog race from Anchorage to Nome. 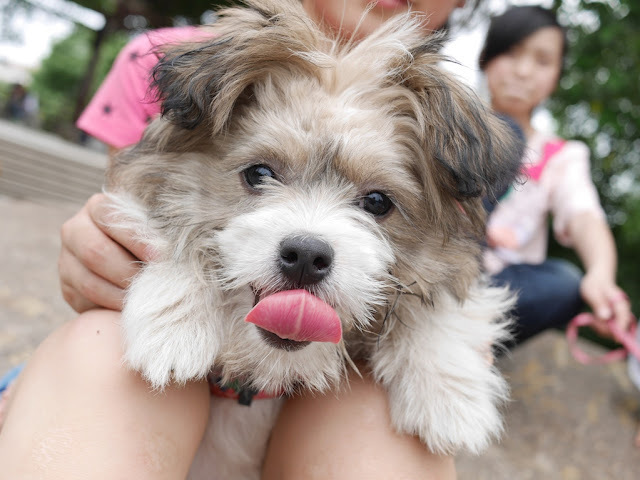 He's spent an estimated $150,000 on the project and weeded through 80 poodles, a span of six generations, he said. "It just didn't sell," he said recently by telephone from his home in Chugiak. "You can score on the news with poodles but you can't get a cup of coffee or a bag of peanuts with them." I don't know if the woman I saw today has gotten any bags of peanuts with her dog. At least it appears she has a furry companion though. 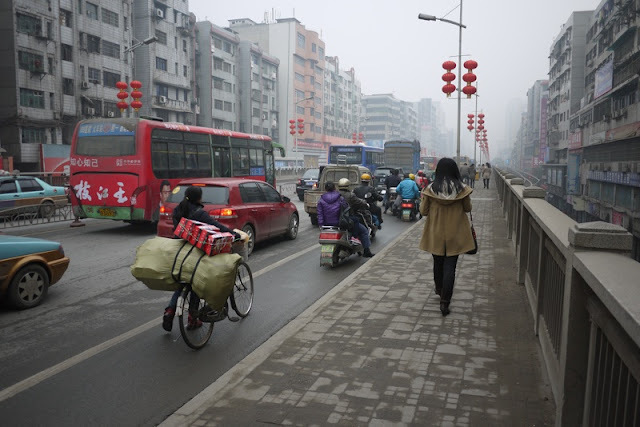 In Hengyang, Hunan province, I have frequently passed a street food vendor who sells roasted chicken. A chicken leg costs 5 yuan (about U.S. $0.80). Most of a small chicken costs 15 yuan. The sign below the rotating chickens advertises "新奥尔良烤鸡"--"New Orleans Roasted Chicken". 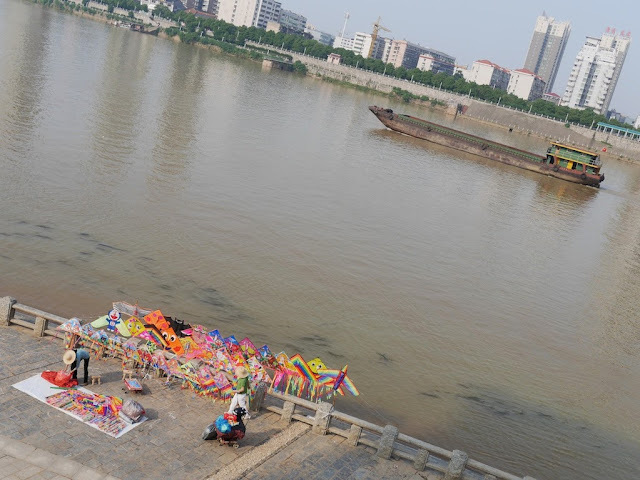 It may come as a surprise to New Orleanians that their city has received this type of attention in Hengyang. But like roasted chicken vendors, "New Orleans style" chicken is not unique to Hengyang in China. For example, it is easy to find marinades for sale online. It is also offered at a popular fast food restaurant chain: KFC. Despite their names, after seeing or tasting them, neither the street vendor's roasted chicken nor KFC's roasted chicken sandwich would have made me think of New Orleans on their own. And I don't see anything very similar to them in lists of "New Orleans' most iconic sandwiches" or "great roasted chickens" in New Orleans. When I think of New Orleans, chicken, and fast food, another American fast food chain first comes to mind though--Popeyes Louisiana Kitchen. The only Popeye's in all of China is at the Hong Kong International Airport. 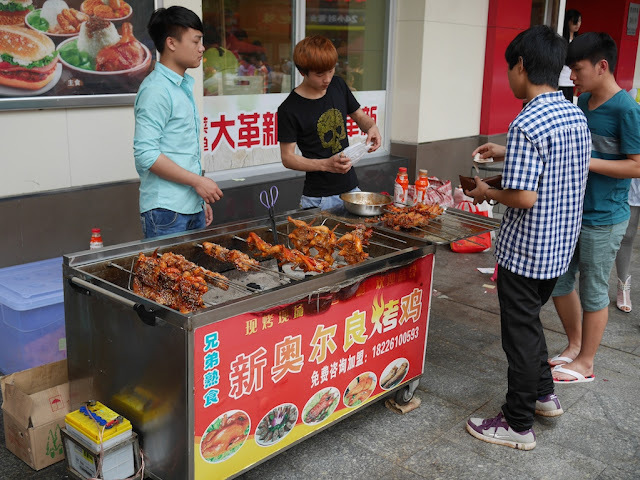 The roasted chicken vendor and KFC are related in another way: one of KFC's over 4,000 restaurants in China is located directly behind the roasted chicken vendor's usual location. 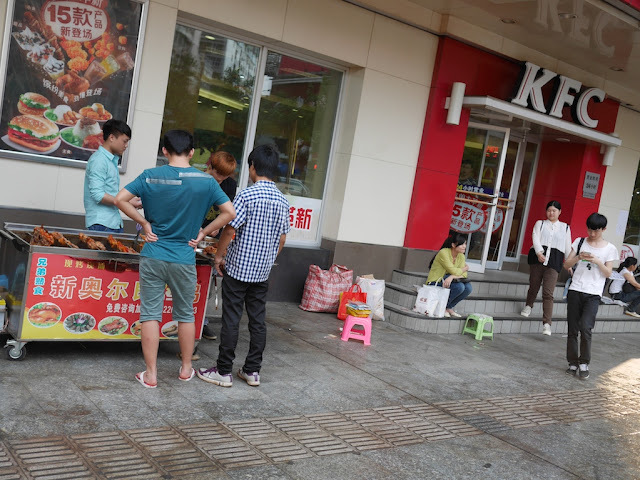 I don't know what KFC thinks of this, but chengguan could be a bigger concern for the vendor. And even if nobody believes the food vendor is directly connected to KFC, I wonder if the vendor's location may cause KFC's brand to positively influence customers' perceptions, similar to the potential effects of imitating well-known brand names. Whatever the case, perhaps the street vendor could further distinguish himself by diversifying his offerings based on the New Orleans theme. 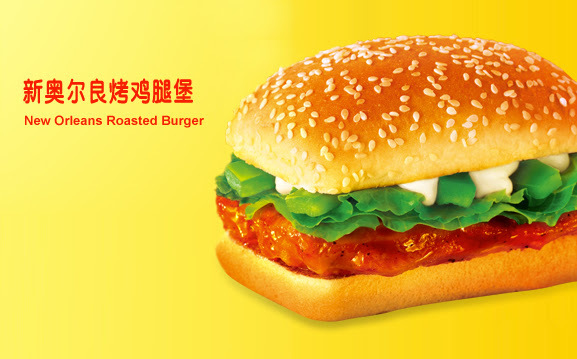 Personally, I would hope for muffulettas, but I suspect something from Popeyes menu with its spicy fried chicken would far better suit people's tastes in Hengyang and elsewhere in Hunan. Whether you like the short film or not, "Bisou"--an informal French word meaning "kiss"--may leave you thinking for a longer period of time than the less than two minutes it lasts. 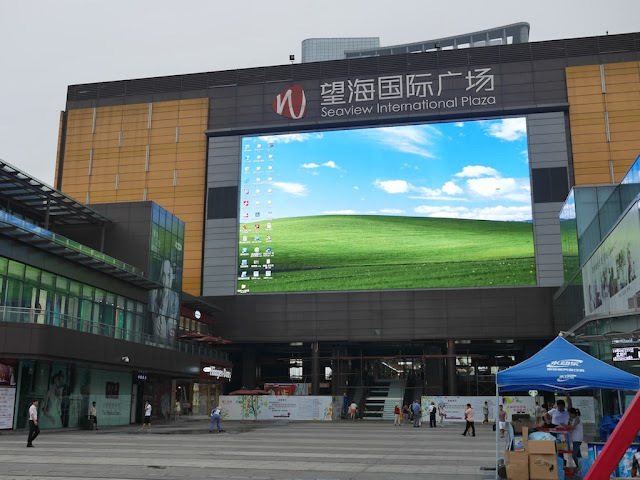 Unlike a similar screen at a shopping mall in Haikou, a giant outdoor screen at the Shin Pin Shopping Mall in Hengyang was not displaying a static Windows desktop when I passed by. 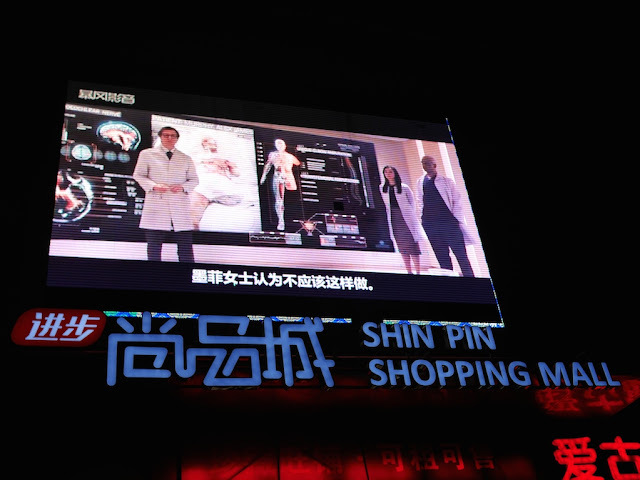 Instead, it was displaying something else with a U.S. connection--the remake of the science fiction film RoboCop. The audio was in English, and the subtitles were in Chinese. Based on the 暴风影音 logo, it looks like the movie was provided through the Chinese video streaming service Baofeng. 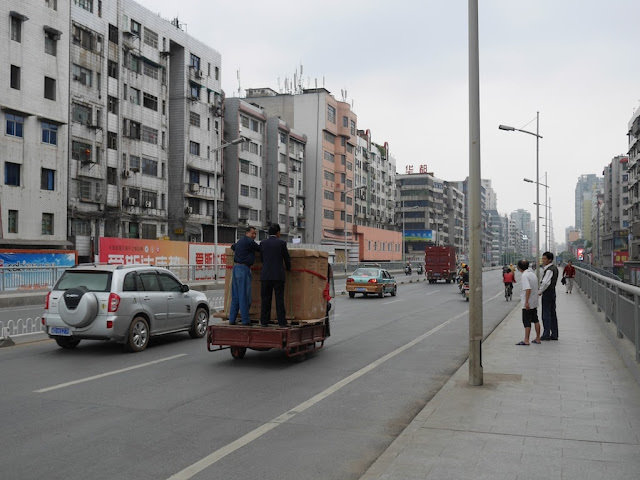 And not surprisingly, the screen was receiving more attention from people than the screen I saw in Haikou. Scorpion Bowls: A Great Drink to Pair With Chinese Food? Routinely found at Chinese restaurants, this punch-like cocktail is absolutely mouthwatering. This goes great with Chinese and Polynesian food. After a few moments of thought, I assumed the writer was specifically referencing American-style Chinese restaurants in the first sentence. I have never seen this drink served at a Chinese restaurant in China, which I feel safe saying has the largest number of Chinese restaurants in the world, and I am highly skeptical it is common here. Yet another site claims the cocktail is "now served in Tiki bars and seedy Chinese joints around the world". "Joints" is broader than "restaurants" and "seedy" could be an important qualification. Perhaps I would find something different if I frequented a certain category of KTVs, clubs, and bars in China. However, if I wanted to find a drink like this in China, some more upscale Western-style bars not found in most cities would first come to mind. The second sentence in the description is what most caught my attention. I questioned how a single drink could "go great" with everything from tongue-numbing Sichuanese dishes to sweeter and less pain-inducing Shanghainese food. I would expect that such a versatile drink would pair well with much more than only Chinese and Polynesian food. Again, I quickly assumed the writer had typical American-style Chinese food in mind. The diversity of tastes would be narrower than the full range of Chinese cuisines. Still, a presumably strong-tasting drink that complements everything from moo goo gai pan to pepper steak? That is probably more likely if one is well into their scorpion bowl before eating. More than any purely edacious or potatory influences, I wonder if the "goes great" simply reflects an association of this drink with a subset of American-style Chinese restaurants in the U.S. The drink reminds me of a Chinese restaurant which was near my alma mater in Baltimore, Maryland. I don't recall whether scorpion bowls were on the drink menu, but one could order similar cocktails with liquor and fruit juices, such as zombies. More important to some students under the age of 21 than the exact drinks offered, this particular restaurant rarely asked for ID when cocktails were ordered. The students probably wouldn't argue that the drinks went great with Chinese food. 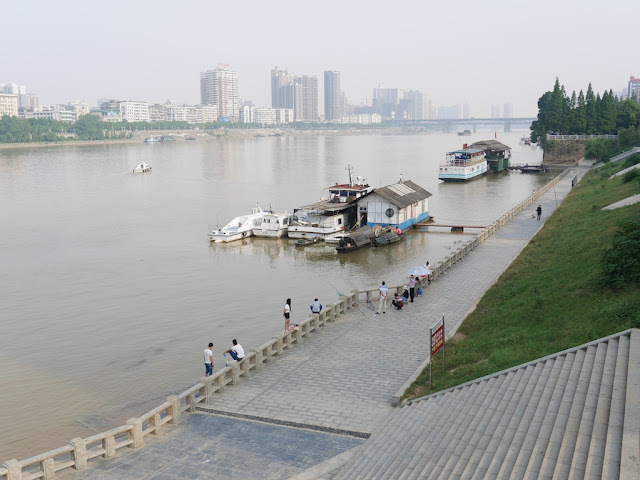 Now seems like a good time to share photos I took this month from locations similar to the locations of two photos in a set of scenes from Hengyang I posted over two years ago. 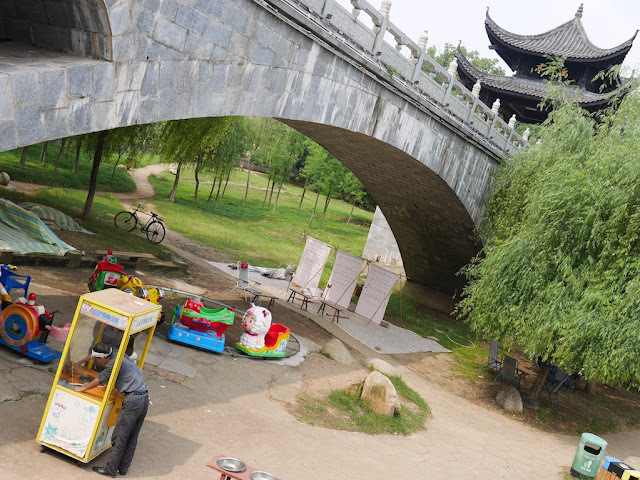 I recently shared some scenes located under traditional style and more modern style bridges in Hengyang. The photos below were instead taken while I stood on a bridge. Some of the differences can be attributed to the time of year. For instance, the red lanterns in the third photo likely reflect Chinese New Year being less than a month away. Other differences, such as the new buildings on the right side of the second photo, reflect more permanent changes. And what has not changed can be just as interesting. *As usual, click/tap the photos for larger versions. 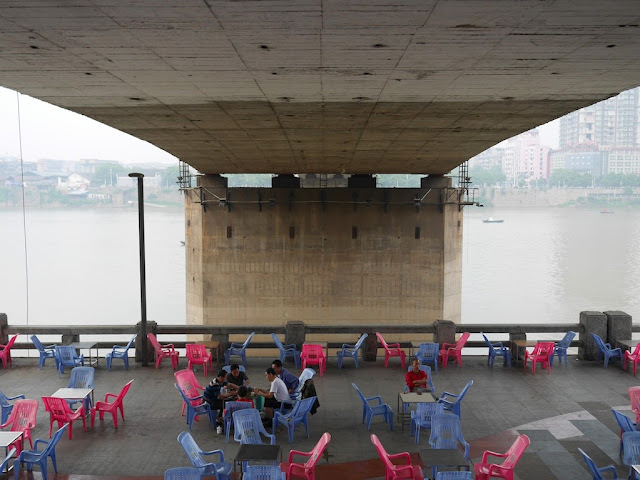 Dancing, walking, contemplation, and playing cards are all possible under-the-bridge activities. If none of those appeal, riding a kiddie train and shooting at balloons are other options. Dancing, walking, and contemplation are not the only things one can do underneath a bridge. Playing cards is another option. 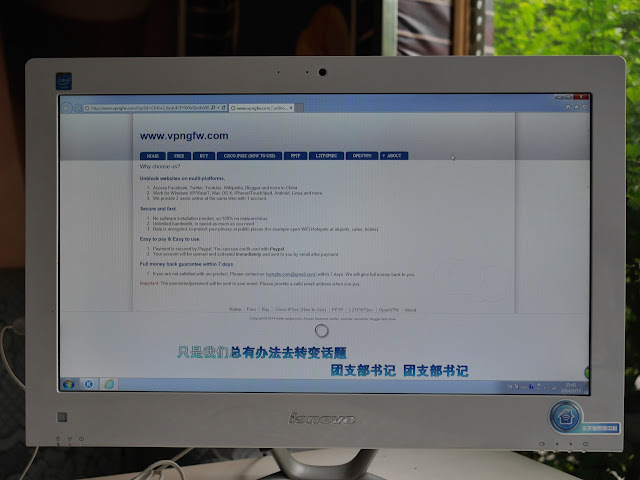 A post related to China's Great Firewall and VPNs I had hoped to finish today still needs some more work and should makes its appearance tomorrow. 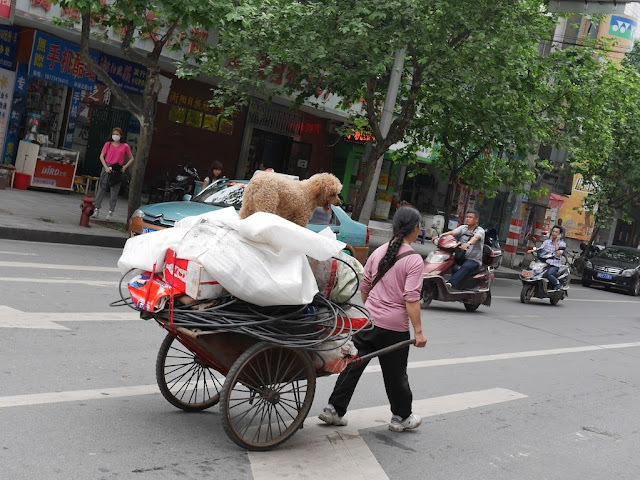 In the meantime, here is a photo of some other technology in China. I don't think the giant screen at the shopping mall was being put to use as intended, but seeing a giant Windows desktop made ponder some possible personal uses for a computer monitor of that size. 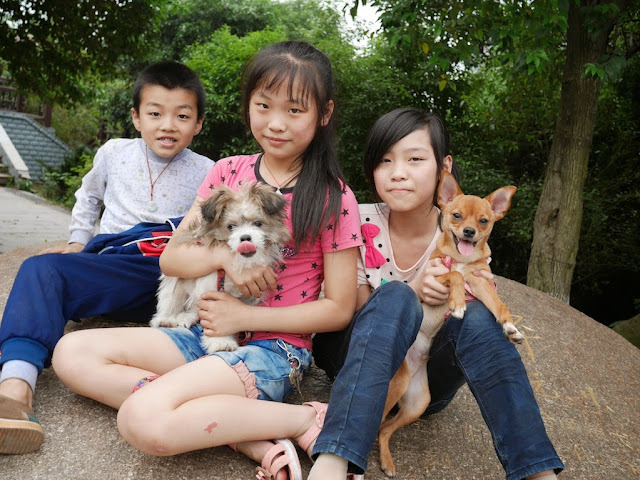 Unlike a Mother's Day several years ago in Zigong, Sichuan province, I didn't see any fashion shows yesterday in Hengyang, Hunan province. However, I saw some signs of Mother's Day at a few shopping centers and stores. One especially caught my eye because of its use of technology and flowers. Outside of a shopping center with small clothing stores primarily targeting younger women, there was a Mother's Day promotion. 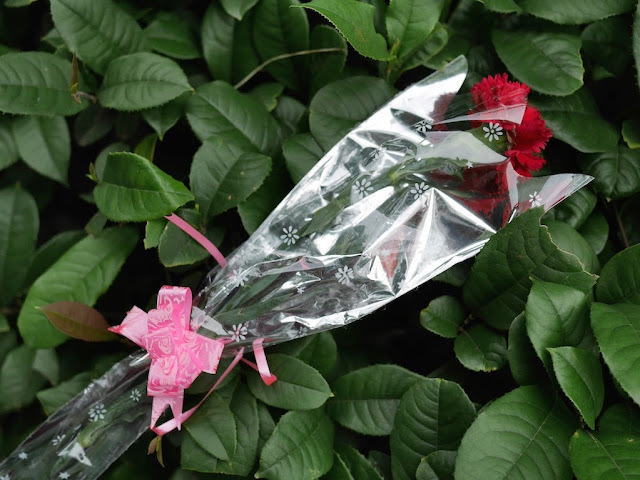 In return for a flower and other possible gifts to give one's mother, people were asked to do two things. 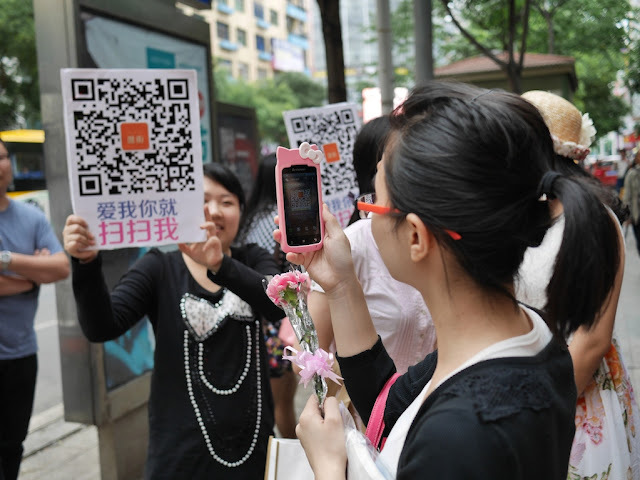 One, people captured an image of a QR code through the mobile phone app for WeChat--called "Weixin" in China. After the code was read, people found that they were now following the shopping center's WeChat account. Two, people were also asked to write their name and phone number on a pad of paper. 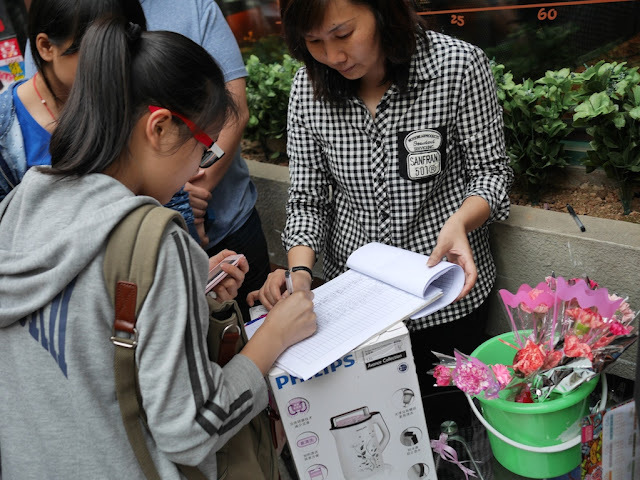 During the time I was around, there was a constant stream of people going taking the two steps for receiving a free gift (sometimes receiving it in the middle if they signed their names first)--a possible sign of many things, including the popularity of smartphones and WeChat in China. 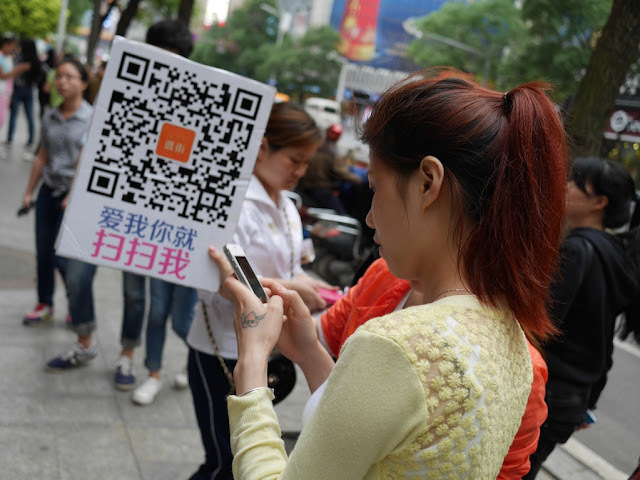 It's definitely not the first instance of using QR codes and WeChat as part of a marketing campaign in China though. The use of a pad of paper instead something more high-tech for collecting names and numbers also raises some interesting issues. Finally, although I didn't follow their WeChat account or provided my name and number, one of the people working for the promotion gave me a flower and a mousepad. Since my mother is nowhere near Hengyang, I was not able to give her the gifts as intended. Instead, I passed them on to people I later met. Perhaps they made their way to other mothers. Knockoffs of well-known international clothing brands are a far more common sight in China than imitations of well-known international hotel brands. Just how common is not simple to pin down though. Depending on the degree and quality of the imitation, it can be challenging to identify knockoffs based purely on their appearance, especially if one is not familiar with the brands. 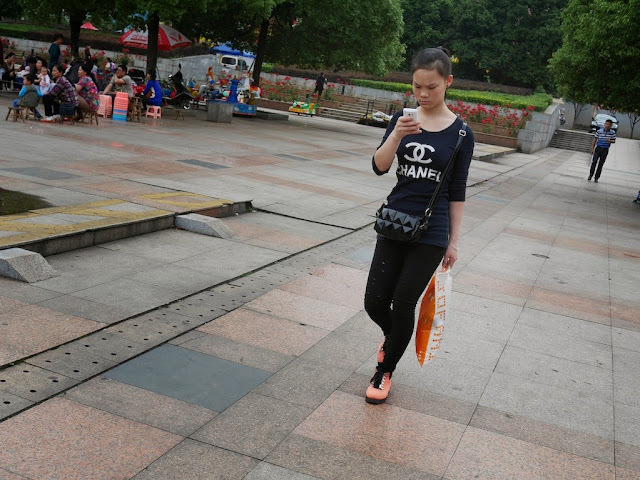 For example, today in Hengyang, Hunan province, I saw someone wearing what appeared to be a Chanel shirt. After a quick check of Chanel's website, I now see that the shape of the two interlocked letters in the logo seems less circular than the interlocked letters in Chanel's standard logo, but I am still not sure whether the shirt is a knockoff or not. I would not be surprised if Chanel could provide a very quick answer. In contrast, there are other shirts I feel confident labeling as knockoffs even without checking a website or consulting a fashion expert. For example, also today in Hengyang, I saw someone wearing a shirt with what is clearly only an imitation of Chanel's brand. As everyone knows, the interlocked letters in Chanel's logo don't have rounded ends. Sometimes it is so easy. 1. This is not at all a common sight for me. 2. 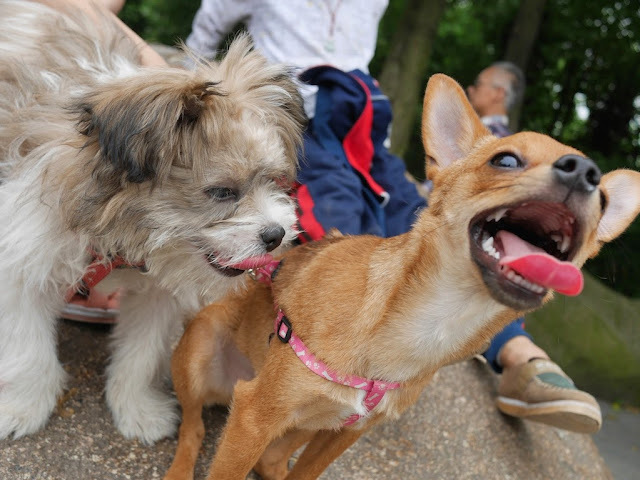 The dog was running at a decent speed for its size and, as seen in the photo, leading the way. Sorry, no video. 3. The dog was not pulling the motorbike. Her dream phone was a Nokia. Not because of any concerns regarding fashion but because she believed it would be very reliable and rugged. However, a real Nokia phone was not a possibility given their relatively high price so she wanted to get a fake Nokia phone since it would be cheaper. Unlike many other examples I've seen of purchasing fake products, her choice of a fake Nokia versus other relatively inexpensive options did not appear to be driven by how others around her would perceive the product. It was about her own internal expectations for what the product could provide to her based on its name - even though it would be a fake. The hotel and mobile phone examples show if brand X's name is used in some way by an known imitator in China, people can have an expectation that an X-ish level of quality or type of experience will be delivered. If the imitator is then chosen, those expectations may positively color later perceptions, or they may draw attention to any shortcomings. That brand names can have such powerful carryover effects for known imitators is yet another sign of their value. Surely this effect is not limited to only hotels and mobile phones. And it is one reason why customers' being able to distinguish genuine from imitation isn't necessarily enough for a company to avoid losing business to its imitators. After I took a photo of an architecturally intriguing department store while I waited at an intersection in Hengyang, Hunan province, someone behind me enthusiastically said in English, "Beautiful!" When the light turned green he rode off with a hearty "Goodbye". A little more than 10 minutes later as I was walking on a sidewalk, a college student I hadn't noticed before approached me and said hello. Without any prompting from me, he then shared that he felt pleased about having just earned money for handing out flyers. 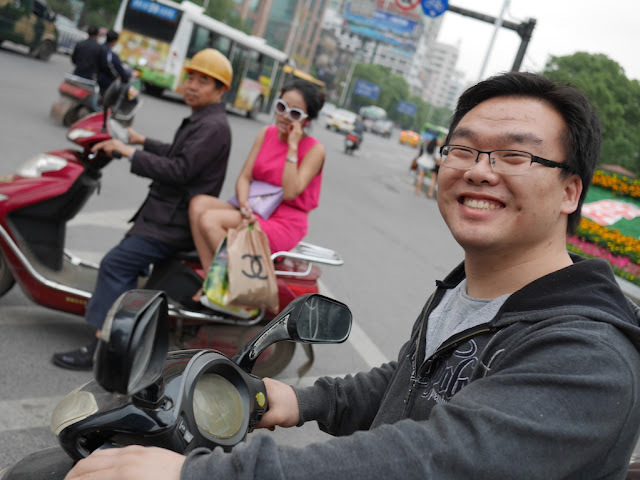 I found out he made 40 yuan (about US $6.40) for 6 hours of work--less per hour than the amount earned by two college students I met a year and a half ago in Hunan's capital, Changsha, who had similar part time jobs (see here and here). 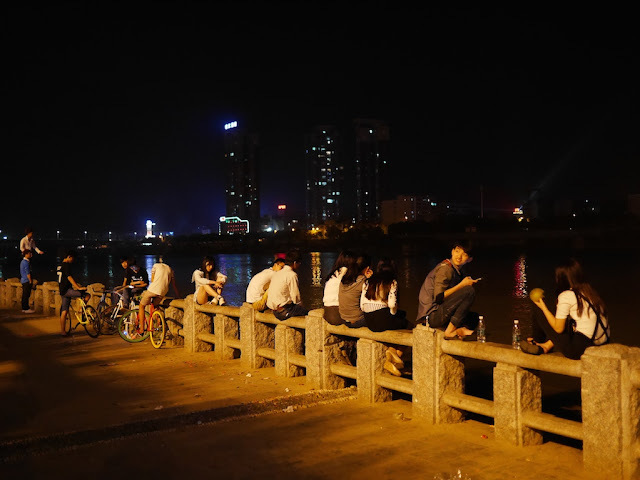 I would not be surprised if the going rate was lower in the smaller city of Hengyang, though, and I have met many students elsewhere in China who would consider his part-time job a good deal. So I congratulated him, and he then headed to a bus stop to take a bus back to his university. 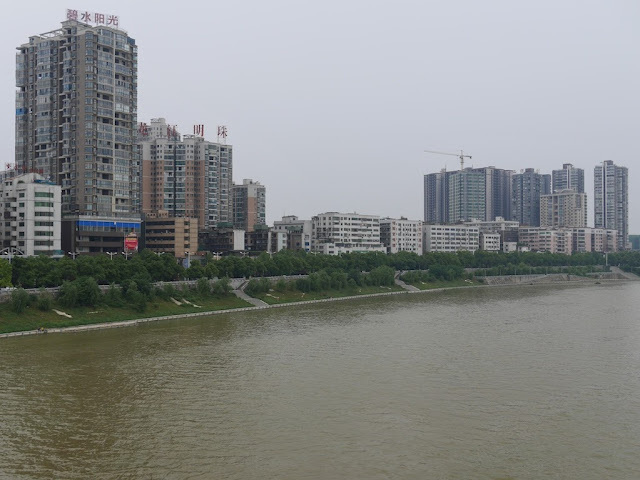 These two brief experiences made my Saturday in Hengyang a little more interesting and touch on themes, some more obvious than others, I have raised before. And as much as the experiences were unexpected, neither was unprecedented, and they are consistent with others I have had in China. 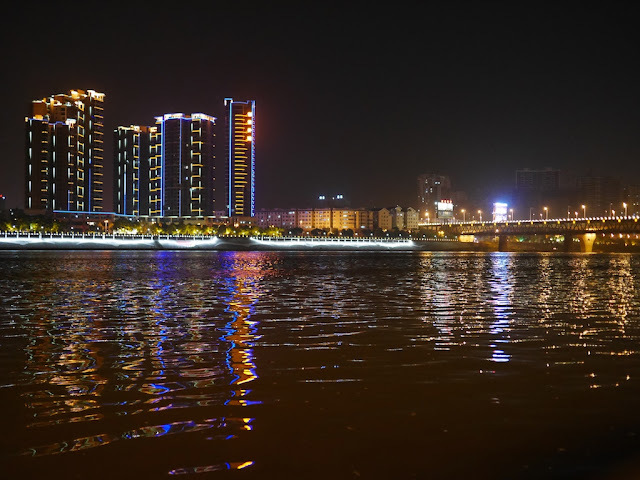 For a nighttime view of the Xiang River elsewhere in Hunan, see the earlier post here.